Do I Have to Tell My Loved One That He's Dying? Family members or friends are sometimes faced with talking about death with their dying loved one and wonder how much information they should give. Cultural or personal beliefs may prevent loved ones from acknowledging or discussing death. Some people believe that telling a dying loved one that he is actually dying will dash any hope and even make him die faster. 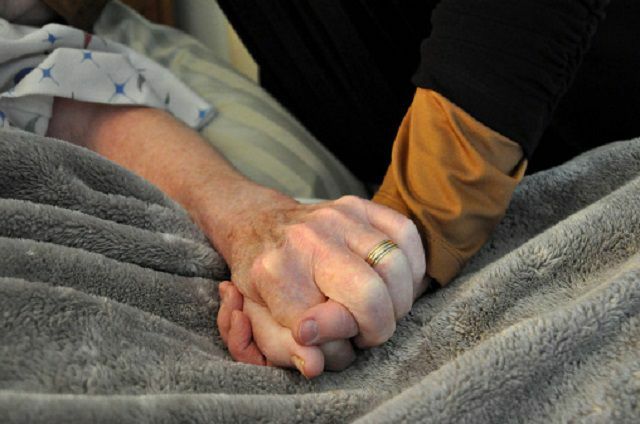 So, how much information should you give your dying loved one? The human spirit is surprisingly resilient. We often want to protect the ones we love from pain and sorrow but the very protection we offer can sometimes backfire. "Protecting" a loved one from the truth about their condition may initially seem like a good idea but withholding information can lead to resentment and disappointment. A person who dies without completing the important tasks of dying may be leaving with unfinished business. Without the opportunity to do these valuable things, your loved one could die with unfinished business. I've heard it said that it's impossible for someone to have hope when they are facing certain death. But I promise you that there is hope for the dying. A dying person has an amazing capacity for hope. He may no longer hope for a cure, or for another 10 years, but he may hope to say goodbye to loved ones and die peacefully at home. He might continue to hope for a miracle cure but plan ahead anyway. Keeping the truth about dying from the one who is nearing death could rob him of the chance to re-evaluate and fulfill his hopes. Mr. H was a hospice patient with terminal cancer and a passion for sports cars. He had always hoped to drive a Ferrari but had never been able to afford one. When he found out that his death was certain he continued to hope for the chance to be in a Ferrari, even if he could no longer drive one. The hospice agency made it happen by arranging a test drive of a Ferrari with Mr. H in the passenger seat. Because Mr. H knew he was dying, he was able to re-evaluate his hopes and knowing there wasn't much time left made him more eager to realize them. Many people truly believe that they can hide impending death from a loved one. Dying is a natural process that the body has to work at. Just as a woman in labor knows a baby is coming, a dying person instinctively knows death is near. Even if your loved one doesn't discuss his death, he knows it is coming. Some ethnic cultures and family cultures simply don't discuss dying and your loved one may be honoring that. He may have gotten the sense from loved ones that no one wants to recognize or discuss the dying process and decided to protect them by doing the same. Death then becomes the unwelcome elephant in the room. Everyone knows it's there but no one will acknowledge it. Family discussions can then be awkward and shallow, never reaching an intimate level. The important work of mending and completing relationships is left undone. Talking about death is never easy. Many of us feel uncomfortable even saying the words "death" or "dying". Talking about it with a loved one who is experiencing it is even more awkward. If you have decided to be open about death with your loved one, you can read some resources that can help. As your loved one begins to realize that death is near, he may move through stages of DABDA. He will begin a life review to take stock of the life he's lived thus far. As death becomes closer, he will know it instinctually.